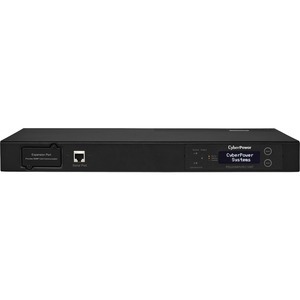 The CyberPower PDU20MHVIEC10AT, a 10-outlet 1U rack mount metered auto transfer switch (ATS) PDU, provides 200-240V/20A output. The PDU distributes power to 10 IEC 8-C13/2-C14 receptacles from redundant IEC-320 C20 plugs. Dual power cords can be plugged into separate power sources to provide redundancy to single-corded equipment. If there is a power failure or an under/over voltage, the PDU will switch to the secondary power source to insure continuous operation. The PDU20MHVIEC10AT includes a SNMP/HTTP card slot for adding an RMCARD202/RMCARD203 (sold separately).